As one of America’s early consumer advocates, Leonor K. Sullivan authored many of the protective laws that Americans have come to take for granted. Initially, it was a lonely undertaking. As Representative Sullivan recalled of her early years in Congress, “Those of us interested in consumer legislation could have caucused in an elevator.”1 During her 12 terms in Congress, Sullivan left her mark on a variety of issues, becoming one of the more influential Congresswomen to serve in the U.S. House of Representatives. In 1959, working with Senator Hubert Humphrey, Sullivan authored the Food Stamp Act. Under the new legislation, low–income Americans would no longer have to rely upon disbursements of surplus food, but instead would be able to use coupons to buy food at grocery stores. During the second Dwight D. Eisenhower administration, however, the Agriculture Department refused to allocate funds for the program, which the conservative Secretary of Agriculture, Ezra Taft Benson, considered improper. Upon the urging of Sullivan, the John F. Kennedy administration reinstated an experimental food stamp program in 1961. In 1964, Sullivan authored legislation to increase the scope of the Kennedy initiative, making food stamps available for poor Americans nationally. On the House Floor, she maintained, “The States and localities, which now bear a heavy financial burden under the direct distribution system, would save added millions under the food stamp plan. Who loses, then, under the plan? Hunger. Only hunger loses.”7 President Lyndon Johnson incorporated the legislation into his “War on Poverty” in 1964, but not before a sharp partisan battle within the Agricultural Committee and the President’s decision to couple the food stamp measure with increased subsidies for wheat and cotton farmers. One of Sullivan’s great legislative triumphs came when she served as the House Floor manager for the 1968 Consumer Credit Protection Act. The bill established “truth in lending” provisions, requiring lenders to provide consumers with information about the cost of credit. “Now we come to the moment of truth in truth in lending,” Sullivan declared to her colleagues during debate. “Will we give the consumer the whole truth in lending, or just part of the truth?”8 When President Johnson signed the groundbreaking legislation, he praised “that able Congresswoman from Missouri,” noting that Sullivan “fought for a strong effective bill when others would have settled for less.”9 Two years later, Sullivan continued her efforts to protect American consumers when she authored the Fair Credit Reporting Act, a bill prohibiting credit companies from distributing false credit information. 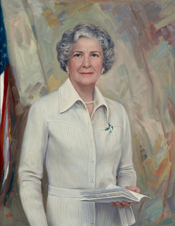 By 1969, after 15–term veteran Representative Frances Bolton of Ohio had retired, Sullivan emerged as the doyenne of women in Congress. The first woman appointed to the House Democratic Steering Committee, which determines Democratic committee assignments, she also was elected secretary of the House Democratic Caucus, an organization to determine party strategy and consensus, for five terms. During her 24 years in the House, Sullivan served on the Banking and Currency Committee, the Committee on Merchant Marine and Fisheries, and the Joint Committee on Defense Production. During the 93rd and 94th Congresses (1973–1977), she chaired Merchant Marine and Fisheries, making her only the sixth woman in congressional history to chair a committee. As chairwoman, her accomplishments included passage of the 1976 Fishery and Conservation Management Act, an environmental bill which established a 200–mile fisheries conservation zone off the coasts of the United States. In 1976, at age 74, Sullivan declined to seek a 13th term and was succeeded by Richard A. Gephardt, who eventually became Democratic Leader in the House. Her age, but principally her disaffection with the institution of Congress, accounted for her decision to retire. She explained in a post–Watergate interview that despite contemporary attempts at congressional reform, she was “disturbed at what’s happening to the whole government … the corruption that always goes on … the lack of morals … too many people thinking, ‘So what?’”14 She returned to St. Louis and moved into a home she had bought long before on the south side of the city, atop a bluff overlooking the Mississippi River. Passing riverboat captains often blew their ships’ horns to salute Sullivan, who had been a benefactor of the barge industry during her time on the Merchant Marine and Fisheries Committee.15 In 1980, she married retired millionaire businessman Russell L. Archibald. He died in March 1987. Sullivan died in St. Louis on September 1, 1988. 1Hope Chamberlin, A Minority of Members: Women in the U.S. Congress (New York: Praeger, 1973): 238. 2Current Biography, 1954 (New York: H.W. Wilson and Company, 1954): 590. 4Susan Tolchin, Women in Congress (Washington, D.C.: Government Printing Office, 1976): 106. 6Chamberlin, A Minority of Members: 236. 7Marcy Kaptur, Women of Congress: A Twentieth–Century Odyssey (Washington, D.C.: Congressional Quarterly Press, 1996): 108. 8Tolchin, Women in Congress: 234. 9Chamberlin, A Minority of Members: 234. 10Quoted in Chamberlin, A Minority of Members: 234. 11Tolchin, Women in Congress: 107. 13Leonor Sullivan’s former administrative assistant claimed that she led the Congresswomen on a march to Speaker Rayburn’s office to demand that he fulfill Griffiths’s request for a Ways and Means position in 1962. However, Griffiths recalls her colleagues aiding her on capturing the Joint Economic position in 1961. See, Kaptur, Women in Congress: 110; Martha Griffiths, Oral History Interview, 29 October 1979, U.S. Association of Former Members of Congress, Manuscript Room, Library of Congress, Washington, D.C.: 51; 136. 14“Leonor K. Sullivan,” obituary, 2 September 1988, Los Angeles Times: 28. 15“Leonor K. Sullivan,” obituary, 2 September 1988, Washington Post: C4. Papers: 1953-1976, 350 linear feet. The papers of Leonor Sullivan contain congressional papers and correspondence, including materials relating to her work on the Merchant Marine Committee, the Banking and Currency Committee, food and drug laws, and issues relating to St. Louis. The collection has some access restrictions. A finding aid is available in the repository. Papers: 1943-1976. 3 feet. Concerns material on the Panama Canal. Includes photocopies of materials in the St. Louis University Library. A finding aid is available in the library. Oral History: 1974-1976, 4 folders. An interview of Leonor Sullivan by Katie Louchheim. Papers: In the Carl Bert Albert Papers, ca. 1910-1976, 1000 cubic feet. Other authors include Leonor Kretzer Sullivan. "Leonor Kretzer Sullivan" in Women in Congress, 1917-2006. Prepared under the direction of the Committee on House Administration by the Office of History & Preservation, U.S. House of Representatives. Washington: Government Printing Office, 2006. Ralph Nader Congress Project. Citizens Look at Congress: Leonor K. Sullivan, Democratic Representative from Missouri. Washington, D. C.: Grossman Publishers, 1972.